Nyonya food cooking may differ in taste from one region to another. I've to confess that Nyonya recipes are complicated affairs which requires many hours of preparation of the herbs and spices. My mom is fortunate to have inherited such precious recipes from my paternal grandmother who is a Nyonya. I was introduced to Nyonya food at a relatively young age and remember vividly my late granny's scrumptious meals which include Perut Ikan, Fish Pickle, Gulai Tumis, Jiu Hu Char (Stir-fried turnips and carrots with dried cuttlefish), Sambal Prawn, Chicken Kapitan and many more. 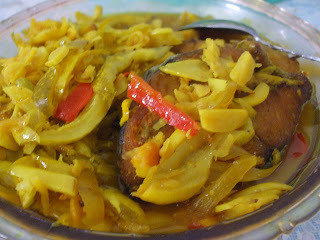 I have always been spoiled by my mom's amazing nyonya fish pickle, so rarely I can find others that is up to par. Acar fish is fish slices that are deep-fried and are pickled together with white vinegar, slices of cucumbers, gingers, turmerics, garlics and strips of red/green chillies. it's one of my all time favourite dishes. 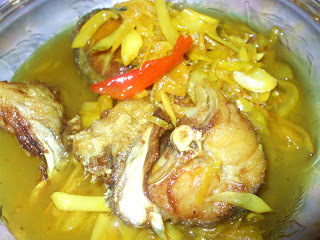 This is surely yummy, I mean fried fish is already nice, then you add the acar pickles to give it the sweet and sour taste = taste bud explosion! XD Suddenly I'm reminded of the Little Nyonya show in Singapore lol. I want one! Looks absolutely yummy! The Acar Fish really looks delicious. I love good authentic Nyonya food too. This dish when left overnight tastes even better.! this dish is not that spicy, but rather, it has a kinda sweet yet sour taste. I've to confess that I prefer to eat rather than cook but cooking is one thing and cleaning up is another! hehe. i'm in the midst of polishing my cooking techniques for this dish. after i acquired this recipe perfectly, i'd definitely share my recipe here. some of my friends are so eager to learn how to cook Nyonya food after watching the show in sg. My hubby will eat whatever I cook though and it is such a great sense of accomplishment whenever my hubby compliments my cooking. Oh no! I'm getting hungry! you're more than welcome to join the crowd.